At the beginning of each upkeep, count the number of permanents. If the number is odd, until end of turn, red creatures get +1/+1 and whenever a player taps a Mountain for mana, its controller adds R to his or her mana pool. 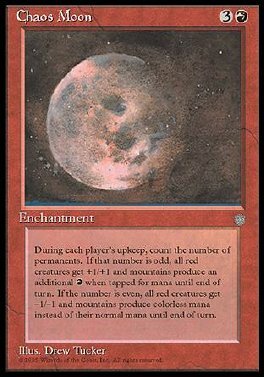 If the number is even, until end of turn, red creatures get -1/-1 and if a player taps a Mountain for mana, it produces colorless mana instead of its normal type.